This snapshot of Pearl Street, looking south from West Chippewa Street, is one of the many urban and rural scenes of Western New York taken with a Graflex camera by Wilbur H. Porterfield, the rotogravure photographer for the Buffalo Courier from 1921 to 1926, and thereafter until 1958 for the Buffalo Courier-Express. 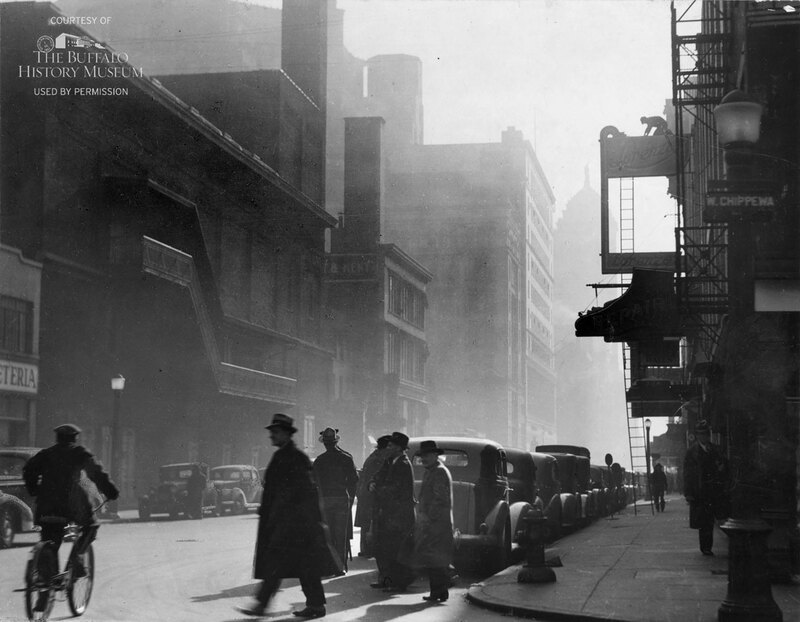 This scene, dated March 6, 1938, depicts, on the left, the Home Dairy Cafeteria, Shea’s Hippodrome Theatre (built in 1914 and demolished in 1983), Flint & Kent department store, D. E. Morgan Building, A. Victor & Co. department store, and Liberty Building. On the right, signs are visible for the Gayety Theatre (built in 1914 and demolished in 1955), Buffalo Rapid Shoe Repair Co., and Lorenzo’s, a popular Italian restaurant that offered a plate of spaghetti and bottle of wine every night for 60 cents. This is one of more than 7,000 photographs that comprise the Porterfield Collection of the Buffalo History Museum. Few of the buildings depicted here still stand today.